Most mass transit systems are designed around a centralized urban core and do not address the emerging polycentric organization of contemporary North American cities. Suburban population dispersion over a wide geographic area, with resulting reduced densities, does not optimize a centralized transportation system. Traditional mass transit systems are predicated on a top-down “fit-the-user-to-the-technology” methodology, which ignores user preferences (i.e. autonomy) and usage patterns (omni-directional), requiring a culture-shift for users which can at best be hoped for, but in reality is seldom seen. Current ride sharing scenarios have limitations because firstly it can only accommodate one or two additional riders per one-car unit. Secondly, in our current cultural climate, sharing rides with strangers raises perceived safety issues amongst segments of the population. The intent of the colloquium is to examine innovative transportation solutions in a systemic manner so as to address the reality of a typical North American polycentric metropolitan area. Instead of examining solutions that apply to idealized (but non-existent) urban centers, this colloquium embraces the contemporary condition — the messy, chaotic, politically and socially balkanized, poly-centric metropolis. By exploring current technologies, as well as those which have reached a high degree of feasibility, this interdisciplinary colloquium will explore the potential of an ubiquitous self-regulating system that can cope with and adapt to the unpredictability of a mobile society. 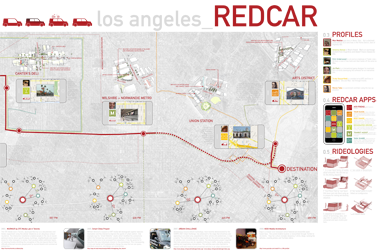 To advance the evolution of personalized ubiquitous and autonomous transportation, the los angels REDCAR concept is used as a starting point (an alternative transportation proposal linking existing infrastructure with P2P communication) as an armature, bringing together the leading researchers for each of its hardware and software components within the context of a complete system. 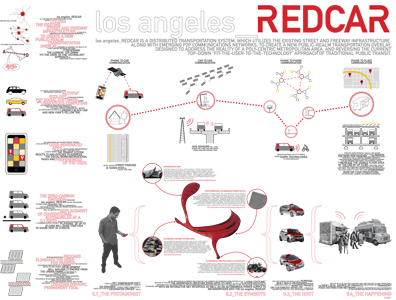 As an invisible extension of the physical and social realms, this can best be described as a singular opportunistic system, combining multiple processes and programs with a mobile embedded information technology platform that incorporates existing transit infrastructure elements (streets, freeways, bus, rail, METRO/BART), wireless/mesh communication networks, personal communication devices and social software. It builds on the inherent autopia culture, by leveraging current social software, P2P and wireless technologies as a means of promoting identity and connectivity. The social networking application builds on similar applications already in use by FEDEX routing processes or amazon.com preferences, and similar to facebook, works through an AI profiling structure, linking friends, transport type and special interests. 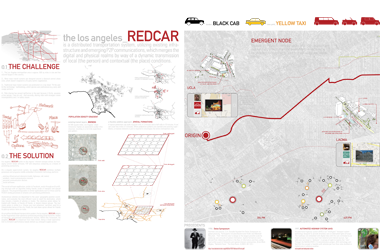 This system explores the possibility of a distributed transportation overlay utilizing existing street and freeway infrastructure, along with the P2P communications networks, to address the reality of a poly-centric metropolitan area such as Los Angeles or the San Francisco Bay Area, with the goal of reversing the current top-down “fit-the-user-to-the-technology” approach of traditional public transit. What would such a ubiquitous system look like and what would it mean to have activity nodes emerge from user interests or social networks in contrast to current centers, which respond to fixed, centrally planned infrastructure? If an activity or development area emerges organically in response to evolving and ever changing social patterns, what does that mean for urban planning and our sense of place?